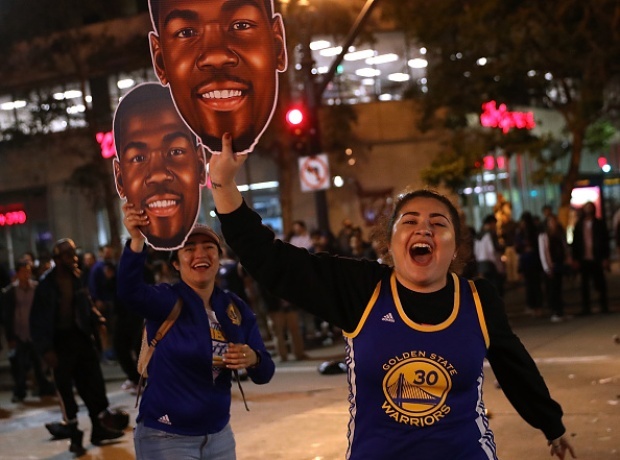 Fans poured out into the streets of Oakland on Monday night to celebrate the Golden State Warriors winning the NBA championship, the team's second in three years. Oakland police shut down 14th and Broadway to allow the throng room to revel in the home victory. The crowd was celebrating peacefully moments after the big win, as fireworks were set off above Oracle Arena. Following Golden State's second title in three years, "Dub Nation" fans celebrated the feat with total jubilation. Elsewhere in Oakland police responded to sideshows. The illegal activity prompted officers to issue citations and tow cars, according to police. Fans also took to the streets in San Francisco. Crowds were seen gathered at all corners of the intersection of 24th and Van Ness streets, at times bringing traffic to a standstill.